A German right-wing politician says his country should halt immigration for Muslims and others who “are completely foreign to our cultural traditions.” He says Germany should no longer support immigrants who make no effort to integrate. "We should no longer support immigration by people who are totally foreign to our cultural traditions, in fact we ought to block it," Alexander Gauland, a senior official with the Alternative For Germany (AFD) party, told the Tagesspiegel newspaper Tagesspiegel newspaper in an interview. “There are cultural traditions that make it difficult to integrate here… those cultural traditions should be left back at home in the Middle East," Gauland, 73, added. His comments came less than a week after it emerged that Germany’s population had grown by 300,000 during 2014, largely due to immigration. This is the fourth year in a row that the Germany has seen an increase growth, with the number of people living in the country now in excess of 81 million. However, a spokesman from AFD tried to defuse the situation by saying that Gauland was not against Muslims in general, rather he was against certain “cultural traditions,” such as the burqa and violence against women, Der Spiegel reported. Bernd Lucke, who was a founding member of AFD, said his party is looking to create “a Canadian-style immigration law that allows economic immigration, but also for family or humanitarian reasons. This is a clear policy position and there is no reason to change this." He also wants to see a points system introduced, which would give those who possess language skills, high levels of education and those with work experience, preferential treatment. “These are important factors that are crucial in helping to integrate immigrants. The AFD refuses to regulate immigration on the grounds of religion, or where the immigrants may have originated from,” he said. The AFD party has recently seen an upsurge in support in recent months, with roughly 69 percent of the country sympathizing with their policies. This popularity is also a sign of AFD moving away from its traditional anti-Brussels stance and becoming ideologically closer to the anti-Islamist movement PEGIDA (Patriotic Europeans Against the Islamization of the West), with the issue of immigration moving to the forefront of their political agenda. However, a recent poll carried out for Der Spiegel would seem to show that not everyone in the country sees immigration as a pressing issue. Twenty-six percent of those surveyed believe that Germany should allow an increase in the number of migrants Berlin lets through its borders, while 27 percent feel on the contrary, there should be a decrease. Around 43 percent of those polled say the current immigration levels are fine and do not need to be altered. Gauland says the anti-immigration drive by PEGIDA is not racist, but rather, “a people’s movement” that he believes is comparable with the early anti-nuclear demonstrations that helped to launch the Green party as a political force in Germany. He was originally a member of the Christian Democrats Union (CDU), before quitting and helping to form AFD in 2013. He says that Chancellor Angela Merkel’s comments that “Islam belongs to Germany” could prove to be fatal for CDU and AFD is ready to pick up the disenfranchised voters. “The chancellor's words were deadly for ordinary CDU members,” Gauland said. During Germany’s national elections in 2013, AFD narrowly failed to reach the 5 percent electoral threshold necessary to enter parliament, claiming 4.7 percent of the vote. But the party managed to win seven of Germany’s 96 seats in the European Parliament during last year’s European elections. Merkel has hit out at the anti-Islamist sentiment in Germany that has been stirred by the emergence of PEDIGA. She joined a rally in Berlin on January 13 to promote “religious tolerance” amid ongoing mass rallies against immigration policies and the growing “Islamization” of the West. Germany’s Foreign Minister Frank-Walter Steinmeier also voiced concerns over the rise in anti-Muslim moods in his home country. “At home, we underestimate the damage that PEGIDA’s xenophobic and racist slogans and placards have already had,” he added. A rally held by PEDIGA in Dresden on January 12 attracted some 25,000 protesters who were complaining about perceived large-scale immigration in the city. However, less than 3 percent of the capital of Saxony’s 100,000 population were born outside of Germany, and just 0.1 percent of people from the city are Muslims, AP reported. 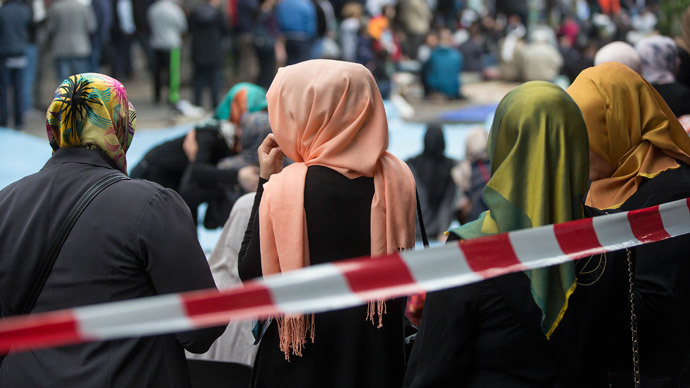 A poll carried out in November and commissioned by the Bertelsman Foundation think-tank said that 57 percent of non-Muslims surveyed thought that Islam threatened German society. In addition, 61 percent of respondents said that Islam did not fit into Western society. According to census data from previous years, Islam is the second-largest religion in Germany after Christianity.